Alligator Records is pleased to announce the signing of Boston-based soul singer/songwriter/guitarist Jesse Dee. With his warm and honest sound, his instantly memorable melodies and positive, slice-of-life lyrics (evoking the heyday of the Brill Building songwriters), Jesse expertly updates soul music for contemporary audiences. 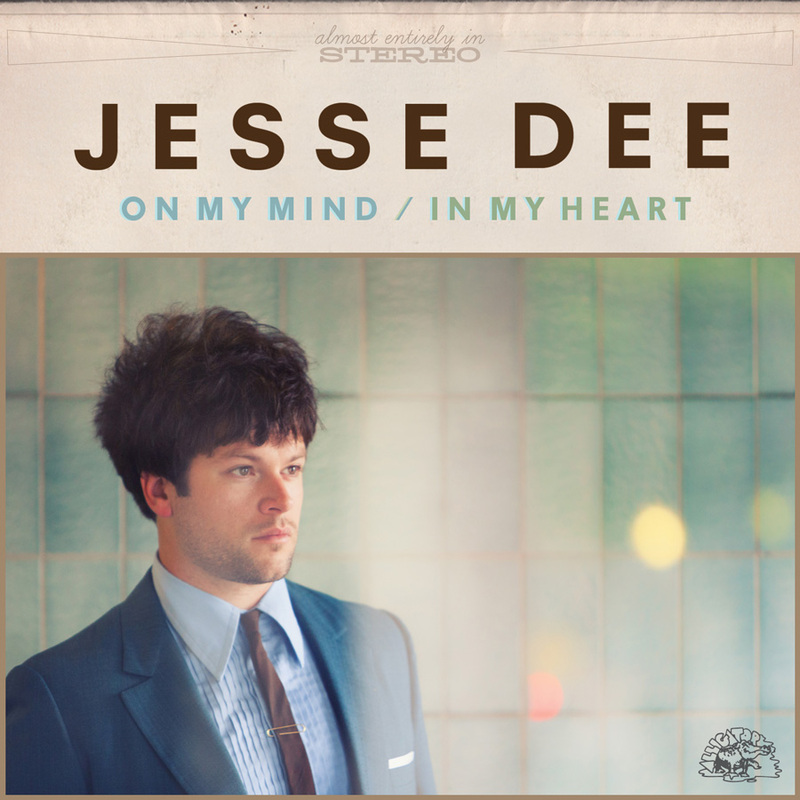 Dee's label debut, On My Mind / In My Heart (AL 4952), will be released on February 26, 2013. He will kick off a national tour with a hometown CD release party on Saturday, March 9 at Boston's Brighton Music Hall. The new album, eleven original songs produced by Dee and Jack Younger, is a sweet soul masterpiece full of good vibes and funky, joyful music. Like Sam Cooke, Dee writes about real life with true emotional poetry. His lyrics are set to toe-tapping melodies with horn charts channeling The Memphis Horns and 1970s-era Van Morrison. "I'm a music fan first," Dee says, "so it's important to me to seek out and create with original ideas. That's why songwriting is so important, and why I mean every word I write and sing." Dee won the 2010 Boston Phoenix Music Poll Award For Best R&B Act, both for the strength of his live show and the aftershocks of his 2008 debut CD, Bittersweet Batch (7Not Records/Munich Records). Dee regularly plays to packed clubs in New England and has toured Europe multiple times, earning new fans at every gig. Dee has opened for soul greats Al Green, Solomon Burke, Etta James, Bettye LaVette, and blues rockers Los Lobos and the J. Geils Band, and has shared stages many times with fellow soul singer James Hunter. The Boston Herald declares, "Dee has an explosive voice. He possesses a powerful, raspy tenor and an uncanny phrasing ability that can't be taught." Born in 1980 in Boston, MA, Dee grew up in nearby Arlington. He got his first taste of soul music from local oldies radio station WODS when he was eight years old. As a child, he was drawn to the sounds of The Drifters, The Shirelles, Smokey Robinson, Sam Cooke and other doo wop, Motown and R&B greats. He was playing guitar by age 18, and by 19 was fronting a band. During this time, Jesse immersed himself in the music of Otis Redding, Jackie Wilson, Solomon Burke, Etta James, James Brown and all the deep soul masters, listening, learning, writing and continuing to hone his craft by playing live every chance he could get. Dee attended Massachusetts College Of Art And Design, studying illustration, performance, production, mixed-media and composition. He played in bands and did some touring while in college before fronting his own band and releasing his first album, Bittersweet Batch, in 2008. The New York Daily News awarded the CD a rare four-star review, saying, "I am blown away by what's coming out of my speakers...remarkable... there isn't a bad song to be found...upbeat and soulful." With his new relationship with Alligator Records, Dee will tour widely, bringing his modern, fun and timeless music to clubs, concert halls and festivals all over the world. Dee is proud of the songs on On My Mind / In My Heart, saying the music is a perfect representation of where he is as an artist. "Soul music is capable of touching the greatest and most diverse group of people," Dee says. "All the best soul music is based on shared experience. Songs have the ability to affect people, shine a light, lift them up, and push them forward. There's hope in these songs," he continues, "and people need that now more than ever."